From a chick who first painted over her own noggin-guard because she didn't like looking "strange in it" (women! ), each skate-style Belle helmet's custom-illustrated in acrylic, pencil, and/or ink according to the wearer's request, whether specific (e.g.,"John Wayne as The Duke in a monochrome landscape") or abstract, as in "an image that will calm me down", because whatever skull-crushing activity you're about to do certainly won't. 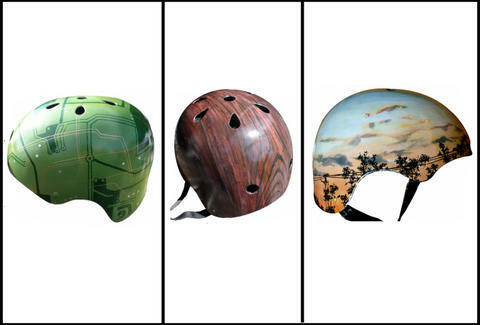 Describe your design idea using the web form, which you'll also use to indicate your head size, and choose between a chip-preventing/water-beading varnish of either yellowing polyurethane for a vintage look, or polycrylic to show its true colors, after which you'll have to ironically protect your helmet from Cyndi Lauper. For anyone lacking inspiration she's got a gallery of previous designs that includes wood-grain effects, a green circuit board, an MC Escher homage, tarot cards, and phrenology charts, the practice of which suggests your head isn't worth protecting. And if you'd prefer a non-skateboard-steez'd skull protector, she'll gladly do any kind that you ship her, meaning those who're picky about their helmets won't be epically crushed, even though their heads might be while their head protection's being painted.